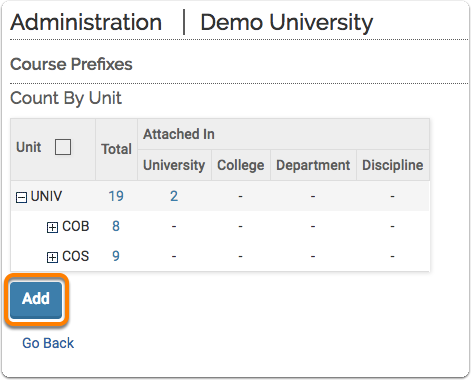 Course prefixes can be added to FACULTY180 on an individual basis, as compared to performing a bulk upload, at any time. Because FACULTY180 organizes courses into academic units based upon ownership of the course prefix, the academic unit that owns that prefix must be specified when creating a new course prefix. This information is used in reports to show teaching data on a per-unit basis. Before creating a new course, the course prefix must be created. Click Course Prefixes in the Add/Edit section. The Course Prefixes screen displays. Click Add. The Course Prefix Form dialog box opens. If necessary, select the unit to assign the course prefix to. Type the new course prefix. A name for the course prefix can also be specified. Click the unit assigned to the course prefix to be edited. The Course Prefix Form screen displays. 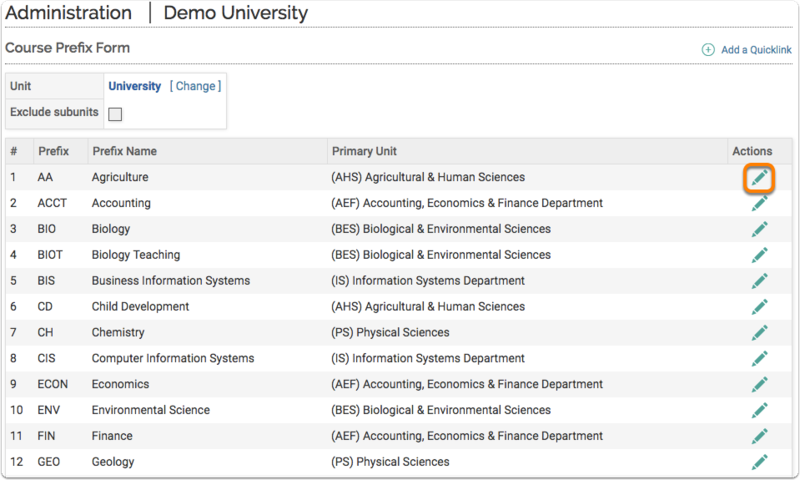 The course prefixes that are assigned to the selected unit are listed. Click the Edit icon adjacent to the course prefix to be edited. The Course Prefix Form dialog box opens. Make the desired changes for the selected course prefix.